Lapland = Santa. Well not always. In fact, it’s only really one month a year when this winter wonderland is awash with families all on the hunt for the man with the beard. But visit in January (as Julian and I did), when Santa is taking a well-earned rest, and you’ll find a much quieter, rather surreal place which is perfect for adults (and older children) to indulge in a host of snowy activities. The real treat of travelling this far north is the spectacular scenery and a magical stillness that’s further enhanced by the fact that it barely gets light - everywhere is cast with an eerie blue tint. Julian and I stayed in a glass igloo in Finnish Lapland and found our surroundings very Space 1999, as we arrived at what looked like Moon Base Alpha. Our first adventure was at the Husky Ranch where we were greeted with the chilling (and incessant) howl of the dogs. We had the opportunity to mush our own team of these beautiful animals. Actually, to be fair, Julian did all the mushing as they (the huskies) were far too powerful for me to control - just a slight release of the break and they were off. Next, we found that accelerating down a Christmas tree lined track on a snow mobile and out into the vast snowy wilderness was pretty exhilarating. A more sedate activity was being taken for a reindeer ride by a local Sami guide - Sami are indigenous Laplanders who were traditionally semi-nomadic reindeer herders. Snuggled up under animal fur in our sleigh and slipping through the silent forest was rather romantic, despite the view of reindeer bottom! Afterwards our host, now in his natty reindeer skin slippers, invited us into his tepee where he entertained us with local songs and rustled up some rather delicious pancakes on his fire. During the day, there’s plenty of opportunity to warm up round the fire with a hot drink. One morning Julian decided to try his hand at ice-fishing. However, the frozen lake wasn’t giving anything away and sadly, despite his best efforts, nothing was caught. For those who prefer activities on their own two feet, snow shoeing is a great way to explore the dramatic scenery. After a day out enjoying all kinds of snow-based activities, a sauna session was just the ticket. People go on special Aurora hunting trips to try and spot the Northern Lights, often with no success. For us, it happened quite unexpectedly on the way back to the airport. We were incredibly lucky to witness (through the glass roof of the coach) a spectacular Aurora Borealis, painting the night sky with a dazzling display of green, orange and purple illumination. 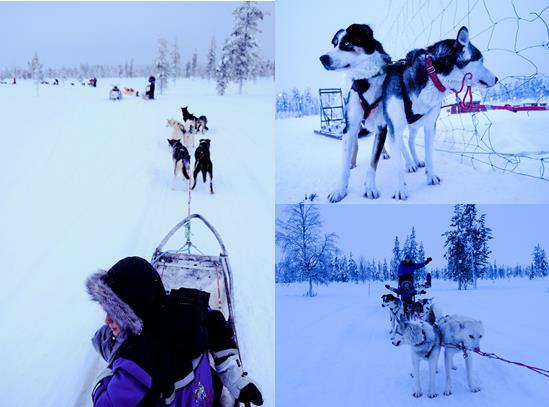 If you haven’t got children in tow or yours are a little past the Santa stage, you’ll find Lapland a magical winter wonderland of a different sort and perfect for a long weekend. There’s plenty more to see than Santa and no shortage of things to do for those who enjoy the snowy outdoors. However, please don’t go expecting luxurious accommodation and gourmet food. 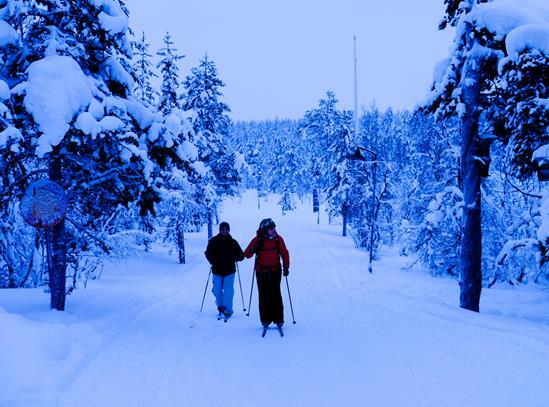 Although you will be very comfortable, a trip to Lapland is really about what’s on the outside, rather than on the in. For more information on a trip to Lapland, please do get in touch.